The debate over medical marijuana is heating up across the country as lawmakers in many states start to weigh in on MMJ measures. Illinois: A proposal to legalize cannabis for medical use via a four-year pilot program has cleared a House subcommittee by a large margin (11-4). The bill, sponsored by Rep. Lou Lang (D-Skokie), now moves on to the full House, where a vigorous debate is expected. Lang sponsored similar legislation last session that cleared the Senate, but he didn’t put it up for a vote in the House for unspecified reasons. This time around, Lang tightened up the already-strict proposal even further to address the concerns of some lawmakers who are on the fence about MMJ. That strategy appears to be working, with one Republican lawmaker saying Lang “worked with every issue I had a problem with,” according to the news site Pantagraph.com. The proposal would allow up to 66 licensed dispensaries and 22 cultivation sites to set up shop across the state. New Hampshire: A key committee approved a medical marijuana bill today by a 14-1 margin, sending it to the full House for a vote. The measure, sponsored by Rep. Donna Schlachman (D-Exeter), would pave the way for up to five state-licensed dispensaries, and registered patients could grow their own cannabis. That last part could be a huge sticking point if the bill advances in the House and then the Senate. Gov. Maggie Hassan – who would have to sign off on any bill – has said she supports medical marijuana but has strong reservations about allowing patients to grow their own. Still, the odds that New Hampshire will pass some form or medical marijuana legislation are high, given the Hassan’s general support and the fact that a similar measure cleared both the House and Senate last year before dying at the desk of the previous governor (who was opposed to MMJ). Iowa: An MMJ legalization bill sputtered out in the state Senate on Monday despite strong support from locals (58% back medical marijuana, according to a recent poll). Some lawmakers expressed fears that the measure would lead to an increase in crime and marijuana use among young people in the state. Backers of the bill said they didn’t have enough support in the Senate and therefore left the bill to die rather than put it up for a vote. A similar measure also died in the House. It’s unlikely Iowa will pass an MMJ measure in the next few years, given the stiff resistance it faces. 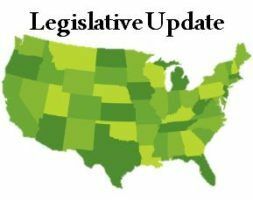 New MMJ bills have also been introduced in other states – such as Florida – over the past week, while lawmakers in other areas including Rhode Island, Oregon, Maryland and Maine have held hearings or are getting ready to debate measures that would legalize cannabis for recreational use. Personally I try as best as I can to avoid any business within the states that are against legalization of cannabis. I realize it doesn’t amount to much but as there is a forced embargo from doing business with similar regimes in the world, this ones voluntary and a peaceful way of disagreeing with what they stand for. @Michele The Marijuana Policy Project and NORML are both having success in pushing reform of laws regarding marijuana. I hope you can get some help soon. Missouri may go straight to recreational use from what I’ve heard. There is substantial resentment in Missouri toward federal interference and that makes it a winning issue for the Show Me state.